Most journalists are taught how to write news articles using the 'upsidedown pyramid' model – put the most noteworthy or newsworthy information first and leave context and background for later. But this is not always the best way to introduce a reader to a topic. So Jeremy Evans, a journalist previously with ITV and Tech City News, has set up Explaain, a new site with articles that he describes as "issues, not news". In the next few months, he plans to release a slightly reinvented version of the online article, where readers can click on sentences to reveal 'cards' which add context to the story – cards which in turn can expand for further context and information. He said reporters nowadays are doing a great job in "back end journalism", in research and investigations, but there are "so many more possibilities for how we can convey the journalism that we're doing to our audiences" on the web. 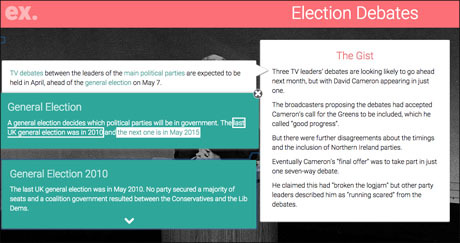 The cards used in Explaain's interactive articles include pieces of information journalists already have at their disposal after researching a subject, but don't always make it into the final story. "All this is doing is making sure that 100 per cent of your research and knowledge is in the final product." A prototype of this new article format is online on Explaain today, but Evans admitted the biggest challenge has been making it simple so readers can "use it instantly and understand what's going on". Article prototype, screenshot from Explaain. "No one wants to be taken through a walk-through tutorial in order to read some news," he said. As some news outlets chase breaking stories and aim to be first, Explaain is part of a counter wave of online outlets that are looking to contextualise information. Explainer journalism was the big trend of early 2014, with the launch of sites like Vox and the NYT Upshot, continued with recent examples like FOLD, a journalism tool launched to help reporters add context cards into their stories. Explaain is also looking at printing out collections of cards in the style of physical exam revision flashcards, available for subjects that don't need to be updated often, such as explaining what the deficit is and how it is different from debt. 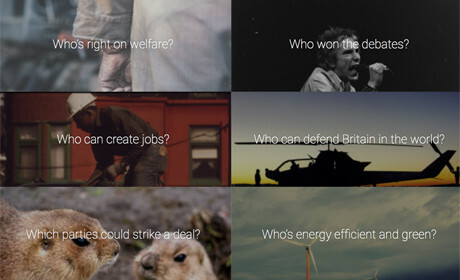 Explaain has been up and running as a daily email newsletter for two weeks, explaining the key subject in the news each day in the lead up to the UK general election on May 7. Each newsletter is designed as a 5-minute read, and also posted onto Explaain's election site as a constantly updated page, asking question like "What are the parties offering on housing?". The newsletters offer an overview of the main parties' view on the subject at hand, as well as related graphs and figures. Evans hopes to have all Explaain features online within months, but in the meantime he will continue to monitor issues that arise from his current election coverage. "Publishers and the media are spending too much time focusing on the value of the now," he said, highlighting the drive to get stories out as soon as possible. "The value of content that can resurface and that, with only a little bit of tweaking, becomes relevant again and again, that's one of the things that I'm trying to exploit."